Installing exterior doors yourself saves money and gives you the satisfaction of crossing another home improvement project off of your to do list. The average DIY homeowner can tackle the exterior door installation with little difficulty as long as she knows how to approach the task. Gathering the supplies for the exterior door installation makes the job easier. You'll want the supplies handy before starting the job. With your supplies in hand, you're ready to begin the installation process. Remove the old door and frame to expose the rough opening. You'll want the rough opening at least an inch wider and taller than your new door frame's outer dimensions. Use the level to determine if the floor where the door will rest is level. You can use shims or spacer boards to level it if necessary. Clean the subsill where the door will rest. You want all of the dirt and debris removed so the caulk can stick. Run two beads of caulk along the bottom of the rough opening, one near the inner edge and one near the outer edge. Place the door into the rough opening from the outside. Start with the bottom of the door, tipping the top of the door outward toward you. Tip the top of the door up into place. Center the door within the rough opening. You want about the same gap amount around the door. Shim the door, starting with the bottom. You can adjust the frame and shims to ensure the jamb on the hinge side is plumb. Hammer in a finishing nail on the hinge side about a foot from the top. This provides stability for the leveled door. Check the top of the door to make sure it is level. Make any adjustments as necessary to make sure the top is level. Add a few finishing nails to hold the top in place. Check the other side of the door to make sure it is plumb. Test the door to make sure it opens and closes properly. It should operate smoothly the way you would expect it to open and close. If it doesn't work well, make adjustments to the door with shims to achieve proper closure. Close the door and make sure the striker side meets up evenly with the weather stripping. Make adjustments to the jamb on that side if necessary to achieve an even contact. Install the door permanently by screwing 3" screws through the shims at the hinges. Recheck the door function to make sure it still opens and closes smoothly. Continue screwing the door into place through shims on the striker side, the top and the bottom of the door. Continue driving in the finishing nails once the door is in place. Install insulation around the door frame. You can use either fiberglass insulation or foam with low expansion levels to prevent distorting the frame. Install the trim pieces to finish off the door installation. Add a bead of caulk along the trim. Step on the door sill once the door is installed to help it connect with the caulk. Don't drive the finishing nails completely in until the door is in the correct position. If you need to make adjustments, it's easier to do if you don't drive them in completely. You want all screws driven through shims. If not, the screw can distort the door frame from the pressure. 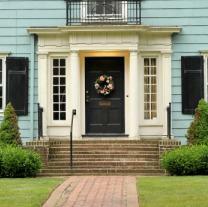 Once you've mastered installing exterior doors, you'll look forward to coming home and seeing your handiwork. With the right tools and the proper installation steps, your new door increases your home's curb appeal and welcomes your guests in style.